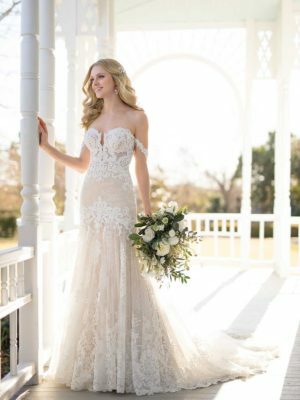 Fit and flare strapless lace wedding gown with guipure motifs. Fitted sequin gown with sheer mesh neckline, giving the illusion that it's a strapless and backless gown! Optional matching cape. 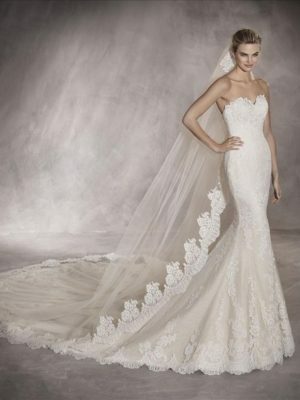 Fitted beaded lace wedding gown with sheer sweetheart bodice adorned by bold lace that is hand appliquéd. Beaded lace off-shoulder straps add a touch of sexiness. A dramatic, soft train finishes off the look. 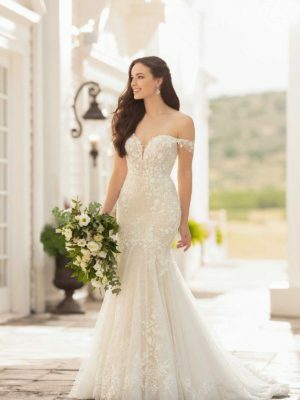 Strapless sweetheart fit and flare lace gown with scalloping around neckline and mokuba ribbon with beaded appliqué on belt. 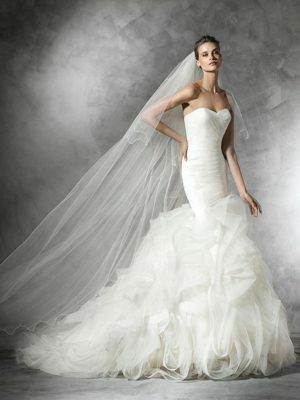 Strapless sweetheart mermaid gown with sheer bodice, lace detail, and beading, finished with a soft, voluminous tulle skirt.